These Candied walnuts are roasted with honey and spices till crunchy, then tossed in brown sugar. 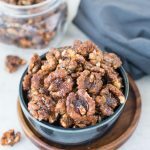 Honey Spiced Candied Walnuts are addictive snacks, can be added to salads and perfect for gifting this holiday season. Pre-heat Oven to 180 degrees. Line a baking tray with a silicone mat. In a bowl take honey. Add Salt, Garam Masala, Cinnamon Powder, Chili Powder and Coconut Oil. Mix well. Mix Walnut and Spiced Honey mixture till well incorporated. Spread walnut in the lined baking tray evenly. Bake in the preheated oven for 25-30 minutes. Keep stirring in regular interval to evenly coat the walnuts. Remove baked walnuts from the oven and let it cool for 10 minutes. Place the honey toasted walnuts in a separate bowl and toss with brown sugar. Then layer the sugar-coated Candied Walnuts in a single layer, until they are completely cooled and crispy to touch.